Home › Veterinary Continuing Education Program - 8 AAVSB RACE Credit Hrs. Veterinary Continuing Education Program - 8 AAVSB RACE Credit Hrs. For more information, call Donna Chandler at 317-769-4649. Good Dog! 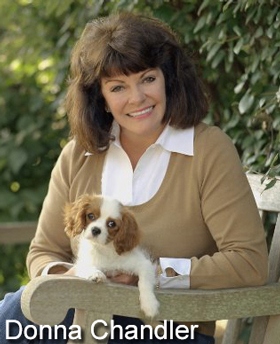 ONE-der Class® and behavior modification seminar is unlike any other! The “Good Dog! ONE-der Class and Seminar” (RACE Program #463-23841) was designed to provide Vets, Vet Techs and Assistants and anyone working with dogs the training and know-how to turn the basic principles of canine training and behavior modification into a new profit center in your current location. This program was reviewed and approved by the AAVSB RACE program for 8.00 hours of continuing education in jurisdictions which recognize AAVSB RACE approval. Please contact the AAVSB RACE program if you have any comments/concerns regarding this program’s validity or relevancy to the veterinary profession. The following topics will be discussed in this seminar. 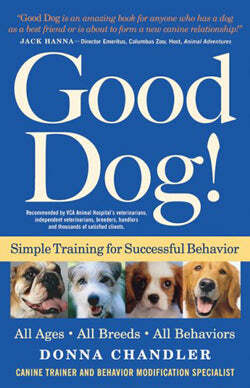 Support material can be found in the “Good Dog!” book authored by Donna Chandler. Ignore dog for two weeks except for training. When out of house you can love dog. Call Donna every Monday (Office) for tweaking the behavior techniques. The following topics will be discussed in this seminar. Support material can be found in the “Good Dog! Seminar” manual authored by Donna Chandler. * This program 463-23841 was reviewed and approved by the American Association of Veterinary State Boards RACE committee to offer a total of 8.00 CE Credits (8.00 max) being available to any one veterinarian and/or 8.00 Veterinary Technician CE Credits (8.00 max). This RACE approval is for the subject matter categorie(s) of “Category Two: Non-Scientific-Clinical” using the delivery method(s) of Seminar/Lecture Interactive-Distance. This approval is valid in jurisdictions which recognize AAVSB RACE; however participants are responsible for ascertaining each board’s CE requirements. Please contact the AAVSB RACE program if you have any comments/concerns regarding this program’s validity or relevancy to the veterinary profession.